Heads up, suspicious scam emails are rife! This isn’t intended to be one of those scary ‘the world is out to get you’ type posts, just a quick note to encourage you to keep your wits about you when reading your emails. I have noticed recently a small rise in scam emails, and though it might be a coincidence, I have also had a few more people asking me about them lately too. Because of this, I thought I’d write a little post on how to avoid getting caught out by them. The sort of scam emails I’m talking about are the ones that are sent in a bid to con you into clicking a link. The link will usually do one of two things. It might take you to a familiar looking login page, a page that might look exactly like a Paypal login page, or a twitter login page, but is actually just a copy of those pages made by crooks designed to capture your details. You enter your normal username and password assuming you are on an official page, when actually all you are doing is entering those details into a form that sends your login details to the crooks – this type of scam is widely known as a “phishing” scam. Alternatively, clicking the link will simply download some dodgy software – or “malware” as its called – onto your computer which is bad if you use it for work and play with your own cheap mechanical keyboard using csgo resources online for games as Counter Strike: Global Offensive or use your phone to use other types of games online or maybe do some online betting with the use of a ladies day guide by comparethebets.com. This malware often does things like tracking key presses and then sending transcripts of everything you have typed to the crooks. Less than ideal if you have logged into private accounts, as the crooks will then have all your login details. You can see now why the banks have been so keen for us to use those little random number generator devices as part of our login process. Anyway, as scary as all that is, it’s actually really easy to avoid getting trapped by them. I’m actually not really an expert in this field at all, I just know enough to stop myself from getting scammed. The main tip I can give you is this – If you get an email that makes you scratch your head at first glance, it is likely a scam, or at least more likely a scam than anything else. If you assume scam before anything else, then you are going to be giving yourself a reasonable amount of protection against the worst. 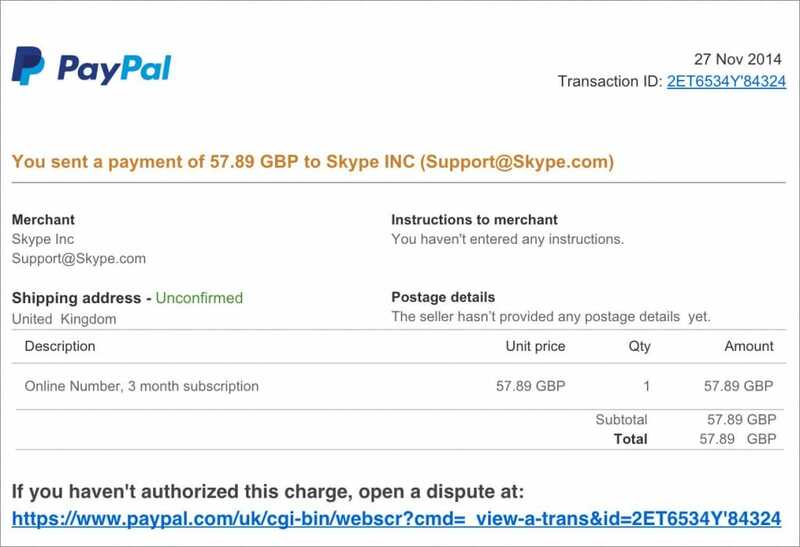 I actually have both a Paypal and Skype account, so the perpetrators have hit lucky with me. They send it out en mass looking for people with both these accounts as it is us that are most likely to fall for this trick. It’s a small amount of money, enough to rouse interest, but not so much that I will instantly recognise it as nonsense. What they are hoping is that I will click on the dispute link at the bottom. Of course, I am wise to this. So the first thing I do is check the two or three usual giveaway signs that this is a scam and not a legitimate email. Firstly, look who sent me this email “paypal(load-of-numbers)@hotmail.com”. If it was from Paypal, it would more than likely be an @paypal.com address. Can you imagine Paypal using hotmail for their communications? No, nor me! Secondly, look at what the largest bit of text in the email is, it’s the bit that says “If you haven’t authorized this charge, open a dispute at:” This is emphasised as it’s the call to action, the bit they want to catch your eye to make you click it in the spur of the moment. Thirdly, look at the link. it looks legit, because it appears to be a Paypal url, but it isn’t. Rather than left click to go to the link, if I right click on it and select “copy link address”, then paste the link I can see that it isn’t a Paypal url that its taking me to. Now why would Paypal send me to a URL that isn’t theirs? The answer is they wouldn’t… Its a scam. 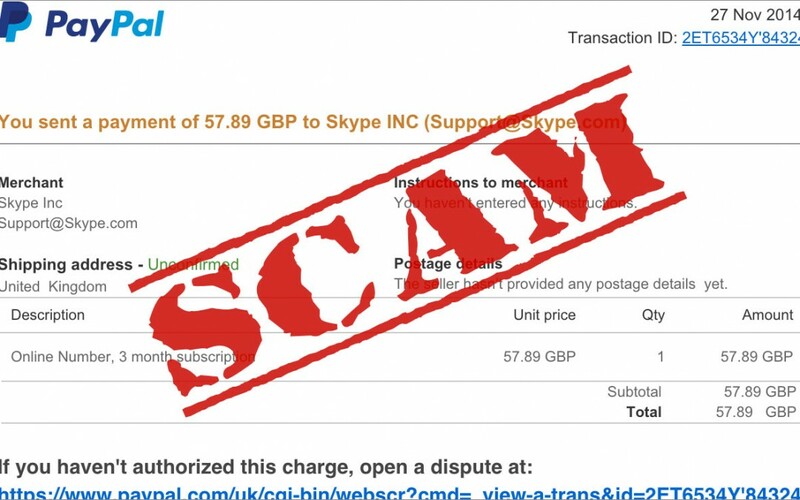 Of course, it might have not been a scam, I might have accidentally been changed £57.89 by Skype, and that would be worth investigation too. But rather than click a link in an email, if you are unsure, you are often better going to the website of the supplier and following their usual support channels either via phone or their support ticket system. This might be a frustrating process to go through, but it’s a lot less frustrating than being scammed! As I said at the beginning, this isn’t supposed to be a post to cause you concern or fear. If these scam emails caused unavoidable issues, then they would be scary, but they don’t! All you need is your wits about you when reading your emails. Follow the simple checks above if anything arises that causes suspicion and the problems that scam emails cause can be easily avoided! Here at F8 we’re full of useful tips and tricks like this, and will be posting many more here on our blog in the future. So if you would like to be kept up to date, then why not follow us on our social media, or subscribe to our newsletter.